It’s been so long, hasn’t it?! I would like to thank my hellish nightmare of a job (which has incidentally now driven me to smoking and drinking heavily) for keeping me so mentally exhausted that all I do now is come home, watch Revenge and surf Indeed.com before passing out. This has lead to my not having cracked a book in some time, which for me is a painful thing. But that will have to change now that we’re entering two major months for books (or at least the ones I’m interested in). First up is the new novel in the Iron Seas series by Meljean Brook, Riveted, released September 4th. I’ve posted before about my accidental falling in love with the series after reading The Iron Duke for Felicia Day’s Vaginal Fantasy Book Club. The second book, Heart of Steel, completely bested the first and although Riveted is not a continuation, but rather new characters set in the same universe, my hopes are high that Brook will continue to improve on her steampunk concept. Yes, I still skip the boobies and coochie bits. On September 11th was the fourth book in the Castle TV show tie-in Nikki Heat series, Frozen Heat. It’s no secret that I’m a super fan of both Castle and the Heat books (let’s choose to ignore the third Derrick Storm ebook for now, mmk?). What I find best about the book series is how well they stand on their own, requiring absolutely no knowledge of the Castle-verse whatsoever. That fact has led to the books being popular with mystery fans in their on right. Well, this one should need no introduction. The 27th of September is the big day for J.K. Rowling. It’s her first book outside of the Harry Potter universe and the entire literary world is waiting to see what she can do without the use of wizards and wands. The Casual Vacancy is such a big deal, the manuscript has been locked up so tight, some say Deathly Hallows had less security. Or maybe I made that up. Whatever. Either way, expect to be hearing about this one a lot. And finally, on October 3rd, we have the much anticipated third book in Rick Riordan’s Heroes of Olympus series. This time around, we’ll get to hear more of Annabelle’s side of the continuing saga. I loved the original Percy Jackson series, but I’m enjoying the Heroes books even more. Riordan’s decision to tell a much larger story from the perspective of multiple characters has really paid off, and The Mark of Athena is sure to feed fans’ hunger once again. Looks like I’m going to be a bit busy until the end of October. Been a long time hasn’t it? I apologize. Work has just taken the creative juices out of me and left me with little time to blog with passion. I am to break that with a quick review of a book I just finished last night. Taken from my Goodreads review. After being turned on to the Percy Jackson series shortly after the 5th and final book had been released, I was ecstatic to find out that Riordan was releasing a new series that took place in the same universe. I thoroughly enjoyed the Percy Jackson books (some more than others), so I knew this was a must-read. Oh boy, was it more than I expected. The Heroes of Olympus series follows a new group of demigods discovering who they are a little later than most, and right from the beginning they are forced into the dangerous world of gods and monsters and must fight for their lives. The only problem is that one, Jason, has just woken up in a strange place with no memory of who he is or how he got there. So, right off I was captivated by this book, more so than with any of the Percy Jacksons before it. Riordan went with a different storytelling method, taking the 3rd person and alternating between the three main characters with each chapter. This gives us more insight into our heroes as a group, while Percy presented us with a firsthand account of his adventures. This alternate method engages the reader so much more as we learn about Jason, Piper and Leo. 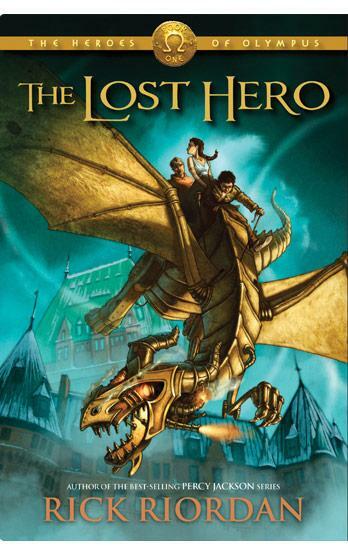 In the past, I had a tendency to find flaws with Riordan’s work, none of which hindered the reader, only broke the enjoyment of reading, but with Lost Hero I struggle to find fault with the story. This time around, everything is less over-the-top when it comes to plot devices, dialog and characterization and concentrates on the people and the epic adventure. I think it took some time for Riordan to settle into the world and characters he had created, but it has truly paid off. In short, I loved every moment of this book and volume 2, which won’t be out until the end of this year, just cannot come fast enough for me. Until then I plan to devour The Kane Chronicles to see how he handles Egyptian myth.